Just one week after S&P, this Friday (22 February) Fitch Ratings has the opportunity to review its Hungarian sovereign ratings. Of the three major rating agencies, in 2016 Fitch was the first to upgrade Hungary from ‘junk’ (non-investment grade) to ‘BBB-‘. It changed its outlook from "stable" to "positive" in November 2017. Almost one-and-a-half years have passed since then, with a lot of improvement in our view. We are optimistic on the upcoming ratings review. In its latest press release (August 2018), Fitch highlighted that Hungary needs to maintain its positive current account balance to earn an upgrade. Despite its recent deterioration due to high domestic demand, we expect the C/A balance to remain in positive territory (helped by newly built export capacities) for the foreseeable future, and putting Hungary above the average (negative) balances of ‘BBB’ countries. A decline in the government debt-to-GDP ratio also needs to be sustained. With this falling to a lower-than-expected 70.9% in 2018, we see this criteria as having been fulfilled. The deficit-to-GDP ratio (2.2% of GDP) came in lower than planned for by the government. Another important factor in an upgrade would be the strengthening of potential GDP growth and an improvement in the business environment. High statistical and methodological uncertainty means we don’t want to argue with the rating agency in this regard, but still see potential Hungarian growth well above the 2% calculated by Fitch. 2018 GDP growth came in at 4.8%, its highest since the beginning of official data disclosure. Last but not least, the latest move by S&P also favours Hungary’s case for an upgrade. Fitch pointed out in August 2018 that fiscal policy is pro-cyclical. This can lead to a deteriorating fiscal environment in the long run. We do not necessarily share this view and see the fiscal policy stance as neutral - our disagreement stemming from the calculation of potential GDP. 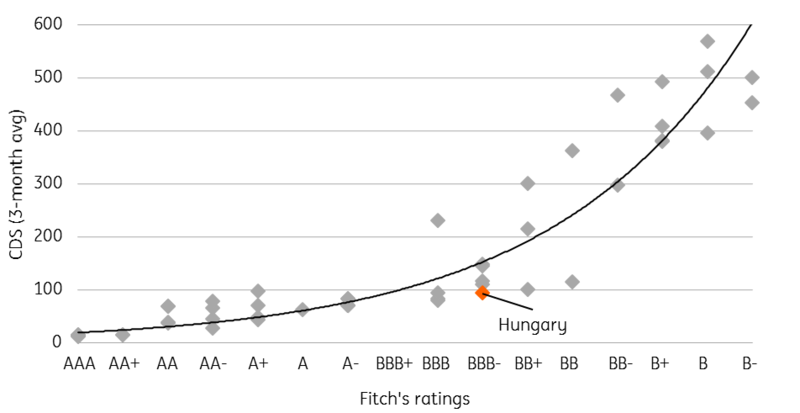 However, we can see Fitch maintaining this argument against a Hungarian rating upgrade. Another common concern among rating agencies is the relatively high government debt level (twice as high as in ‘BBB’ countries), something which still holds despite the ongoing fall in public debt ratios. Since the latest Fitch review, the EU has voted to trigger the Article 7 sanctions procedure, but so far this hasn’t led to any apparent fiscal or economic consequences. Despite talks about a new tool whereby member states that jeopardise the rule of law risk losing EU funds, we haven’t seen much progress on this. All things considered, we see the pros dominating the debate and so a good chance that Fitch will upgrade Hungary to ‘BBB’. A simple affirmation of the rating cannot be excluded. With Hungary’s 'junk’ rating long gone, and based on CDS pricing which shows investors treating Hungary as a ‘BBB+’-country anyway, we don’t expect any major market move in the aftermath of this decision.